Do you have an unending thirst for blood? Do crucifixes really annoy you? Is your wardrobe full of nothing but velvet high-collared capes? 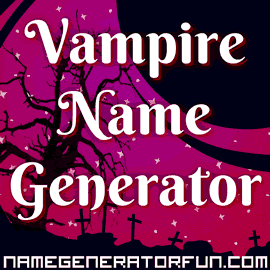 If so, it's time to embrace your destiny as a creature of the night with the original vampire name generator! Have you located a suitable crypt or a sewer hideaway for when the sun rises? Have you guarded against interfering vampire slayers with names like Van Helsing, or Buffy Summers? Our generator creates rough-sounding historical names for unfortunate vampires who have few possessions and only their wits to save them. In life they were preyed on by bloodsucking aristocrats, and in death they have been left alone, as orphans and wanderers searching for kindred spirits and covens to call home. Any budding bloodsuckers have the chance here to either create a random vampiric character, or a unique one that's specifically based on your first and last name. You can choose from lists of names, or pick a fully detailed description of your vampire. There's options for both males and females, and whether you're looking for a new character for a tabletop RPG like Vampire: The Masquerade, a screen name for an online game, or to just add some gothic majesty to your day, you've come to the right place! We hope you enjoy yourself, and that it brings you plenty of blood-chilling, monstrous fun! Our page has been online since Emma created it in 2002, when it was actually combined with The French Aristocratic Version. You can see the old version here via The Wayback Machine, in its original location on Emma's personal website. There were no other name generators of its kind on the internet when Emma created it. The generator went viral in the mid 2000s and then lots of people copied it! Ours are still the only ones that include descriptions of your vampire's personality and give you sinister underworld titles. We hope you enjoy finding out your vampire alter ego – you might also enjoy our pages for werewolf names and cool gothic/emo sounding names if you are looking for something a bit gothic or spooky for Halloween, or just for fun.